The parable is about two different men. The Pharisee and the publican. It is about two different prayers. Two different attitudes. And two different results. 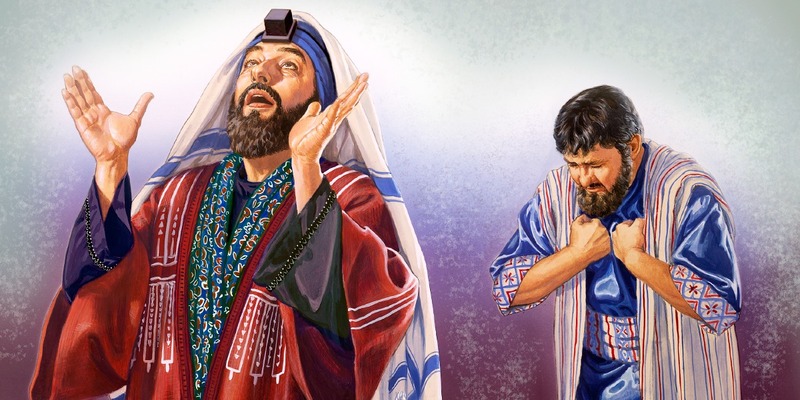 The Pharisee was part of a religious sect of the Jews that was known for being very strict in their observance of the Law of Moses and the traditions of the elders. Literally, Pharisee means “separated ones.” The most devout observed three special times for prayer–9 a.m., 12 noon, and 3 p.m. It was also believed that the prayers were more efficacious if offered in the temple. Publican is another name for tax collectors. They were considered traitors by the Pharisees since they worked for the occupying Roman government. Some were extortioners and collected more than was just for their own personal gain. The Pharisee is thankful he’s not like other people who commit unrighteous acts and live ungodly lives. Like the publican. He recounts his good deeds. And his prayer is self-centered. Self-exalting. And self-righteous. (1) Self-rightfulness is a subtle sin. It’s far too easy to compare ourselves with others. Especially those we deem as immoral, unholy, and unrighteous. Too often in Bible classes I’ve heard comments condemning those not present. Those in religious error. Those who are unfaithful. And those deceived by false religion. We might be better informed and more spiritually edified by applying those passages to our own lives. (2) God hates the prideful attitude. The Bible says so (Prov. 8:13). And what could be worse than displaying our pride when we pray? Like the Pharisee, our arrogance and haughty spirit could be our downfall (Prov. 16:18). (3) Humility is an important virtue. One man possessed it. The other didn’t. In our preaching, our prayers and our daily practice God desires that we truly be humble. Not just act humble. But be humble. (4) Faithfulness is not defined by what we don’t do. Like the Pharisee, there may be many things we’re not guilty of. Adultery. Fornication. Drunkenness. And exhortation. But are we doing what we ought to do? The Bible says, “So whoever knows the right thing to do and fails to do it, for him it is sin” (Jas. 4:17). (5) The internal is just as important as the external. We may not commit adultery, but do we persist in lustful thoughts? We may not steal, but do we covet? We may not murder, but do we harbor hate? (6) Both men were sinners. We parrot Romans 3:23 “All of us have sinned and fallen short of God’s glory.” But do we really believe it? The publican knew it and received forgiveness. The Pharisee didn’t and received a scathing denunciation. What about me? And you? This familiar parable is a powerful story. In it we see ourselves like the proverbial person looking in a mirror. And what does God see?